I had a great education and was fortunate enough to have scholarships to become the first in my family to obtain a Master’s degree. But I made a career choice in 1974 to forego a PhD for experiential learning. I didn’t know that at the time. For me it was a job then not just a student internship. Soon enough, it would become a vocation. This month I had the opportunity to attend the 40th Anniversary Conference of the Council for Adult and Experiential Learning (CAEL). The theme was: “Mobilize Learners. 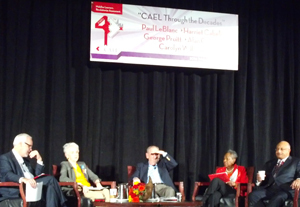 Revolutionize Assessments.” What I learned from the plenary panel “CAEL Through the Decades” was how a movement of committed education professionals have battled over four decades for recognition and resources for adult learning. George Pruitt, President, Thomas Edison State College (CAEL chair 1986-7). First history lesson: 40 years ago, only one textbook had one paragraph that even used the words “experiential learning.” Second factoid: Registrars Rule; not College Presidents. It’s all about the credits. As a past board chair and now a director emeritus of the National Community Reinvestment Coalition, I could relate to the CAEL stories. Their campaigns for social justice then and today for workers who didn’t have and still don’t have the resources for college mirror other justice campaigns. When CAEL started as the “Cooperative Assessment of Experiential Learning,” the founding leaders didn’t intend for it to become an organization, but then advocacy for resources became paramount. One primary testimony to the success of CAEL and its members is the continuing development and deployment of technology to deliver education. One panelist reminded us that while we now rely on email, it didn’t exist as a tool 40 years ago. I remember the IBM Selectric typewriter as a technological breakthrough. Go ahead “google” it if you are too young to know what I’m talking about. Today, CAEL has developed an on-line innovation: Learning Counts to provide portfolio assessments to earn college credit for what adult learners already know. Students can save time and money. It includes a free “Credit Predictor Tool” to identify areas of knowledge and expertise that could be evaluated for college credit. CAEL offers customized consulting solutions for colleges and universities, employers, and workforce developers, based on how to best influence the success of adults seeking further education in their respective communities. As the millennial generation reels from their student debt and Congress continues to ignore interest rate relief, one has to wonder how we are affecting college education for future generations. As one panelist emphasized, the barriers between students and institutions need to be broken down even more now. As another stressed, we are sweeping too many people under the rug by not counting what adult learners know. To no surprise, the CAEL elders concluded their panel by sharing the same concern of the community development field: How to best recruit and build the next generation of leaders to pass on the torch. There are many local initiatives on which communities and colleges could better partner in our collective striving to improve lives and the economic health of families. There is much our two worlds can learn from each other. Could Gentrification Be Changing D.C. Schools for the Better?